O'Neils Bar in St Albans, formally the Peacock, opened in April 2007 following a refurbishment. It is located along the Hatfield road, just a couple of minutes walk from the Blacksmiths Arms. The interior is smart and modern with wooden flooring and wood chairs and tables. The selection of ales was disappointing as although they had two handpumps both were serving London Pride. At the time of the review the London Pride was not at its best. O'Neils Bar does have a small garden but this is right at the back of the pub past the car park. This is a great place to watch sports as they have four plasma screens, often showing different events. 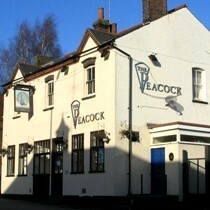 Following a brief spell as Ryan's Bar and formally O'Neils Bar this pub is back to its original name of The Peacock. Hopefully the new owners will replace the horrible orange exterior walls and re-install a couple of real ales.